A Modern English Translation and Commentary by Terence Scully. These three books by François Pierre de la Varenne (c. 1615–1678), who was chef to the Marquis d’Uxelles, are the most important French cookery books of the seventeenth century. It was the first French cookery book of any substance since Le Viandier almost 300 years before, and it ran to thirty editions in 75 years. The reason for its success was simply; it was the first book to record and embody the immense advances which French cooking had made, largely under the influence of Italy and the Renaissance, since the fifteenth century. Some characteristics of medieval cookery are still visible, but many have disappeared. New World ingredients make their entrance. A surprising number of recipes for dishes still made in modern times (omelettes, beignets, even pumpkin pie) are given. The watershed from medieval to modern times is being crossed under our eyes in La Varenne’s pages. So important was this book that English cooks of the time immediately bought copies and one (anonymous) even translated it into English in the middle of the Puritan rule of Oliver Cromwell. This translation, as is the original, is extremely difficult to understand: there are difficult words, omissions, mistranslations, and other opacities. Terence Scully has solved all modern readers’ problems by undertaking a modern translation with detailed commentary of the original French texts. His work takes cognisance of the early English translation, as well as not ignoring contemporary works available to those early cooks for purposes of comparison and contrast. Even French people will want to buy it for what he tells us of the workings of the French kitchen in the seventeenth century. The index is available as a PDF. A PDF of the first fifty pages of the editor’s introduction to La Varenne. A PDF of the preliminary matter. A review of La Varenne by Fay Oliver. A review from Gastronomica by Kyri Claflin. A review of La Varenne by Fay Oliver. As a borderline cookbook addict, my initial instinct on receiving this handsome tome was to skip the seemingly lengthy introduction in order to get straight at the substance, viz the recipes. This was a mistake, for the erudite, expository preface is vital for the fuller understanding and enjoyment of this publication. It opens a window onto the life and times of the eponymous La Varenne, who as chief cook to the marquis d’Uxelles was entrusted with producing impressive food for the highest in the land during the glitter- ing days of the Sun King. The wealth of background information contained in this sec- tion furnishes even the least imaginative among us with the means to recreate lively vignettes of La Varenne’s working environment: an army of kitchen staff with their strictly demarcated tasks–scullions, butchers, roasters, sauce-makers, potage-makers, pastry-makers, etcetera, all toiling away amid the constant heat of the kitchen fire with the clash of the batterie de cuisine, under the exacting eye of the chief cook. Among the impressive contextualization, an account is given of the publishing history of the three works, of which only one, The French Cook, may be fully attributed to La Varenne, The Pastry Chef and The French Confectioner being of questionable provenance. The com- mentator charts the ground-breaking appearance of The French Cook in mid-seventeenth century Paris, where topics typically dignified in print were of a more highbrow nature, and details how it became a victim of its own success, falling foul of hasty, inaccurate re- prints and dodgy translations. Added to all this, further illumination is provided via copious footnotes and six excellent appendices. Having established that the introduction was compulsory rather than optional and having duly digested its substantial material, it was time to revisit the recipes. With my twenty-first-century sensibilities, I did my best not to retch at dishes from the seven- teenth-century table, featuring the likes of porpoise, tortoise and deer udder. On the other hand, recipes like turkey with raspberries had a very modern flourish, and the in- structions for puff pastry approximated closely with those I had followed some months ago while attending a cookery course. And this time I appreciated, for example, the pro- gression of dishes, the significance of ‘meat days’ and ‘lean days’, the ambiguity lurking in the term ‘blanching’ and the thickness of a ‘testoon’: all that, and much, much more. This book is a culinary cornucopia, which deserves to be fully explored and relished. But, like most good things, it takes time. So, rather than snacking on some recent, flash- in-the-pan master cook’s prescriptions, why not try something a little more satisfying, concocted by the original celebrity chef himself, François Pierre, Sieur de la Varenne? A review from Gastronomica by Kyri Claflin. The supportable factual knowledge about the life and work of William Shakespeare is, I think, inversely proportional to the amount that has been and continues to be written about him. The same applies, on an infinitely smaller scale, to the cook François Pierre, also known as La Varenne, author of Le Cuisinier François, first published in Paris in 1651. The uncertainty begins with La Varenne’s very name (and not just the spelling, as is the case with Shakespeare). It turns up on various editions of his Cuisinier as François Pierre, Sieur de La Varenne (meaning that he is the owner of a property called La Varenne), and as François Pierre, dit La Varenne. (which would imply that he is called La Varenne, perhaps as a nickname). Uncertainty also surrounds the question of which books La Varenne did and did not write. His name appears legitimately on one work, L.K. Cuisinier François. Some.people give him credit for at least one and perhaps two or three other books published during the decade following Cuisinier. One questionable attribution is Le Pastissier François (Paris, 1653), and a highly doubtful attribution is Le Confiturier François (Paris, 1660?). Some of the confusion over La Varenne’s oeuvre results from the nature of the book trade in seventeenth-century France and the publishers’ penchant for recombining different books in re-editions, onto which they sometimes even slapped the name of a popular author to sell more copies. Publishers, not authors, owned the texts they printed. 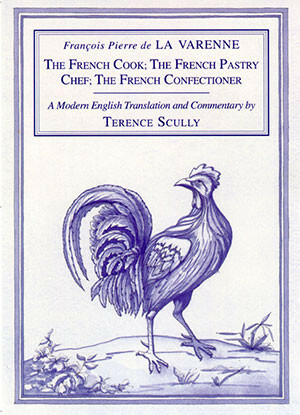 And while the title of the book under review here claims La Varenne as the author of the three works, the compiler, Terence Scully, admits that for the last text “there are only very tenuous grounds for suggesting that the book ever had anything at all to do with La Varenne” (p.40). However, in the pages that follow, Scully simply attributes all three books to La Varenne and describes the recipes as La Varenne’s cooking. What is a reader to think? At the least, the reader must carefully evaluate Scully’s conclusions, as he hardly seems to stand by them. Scully’s long introduction does contain helpful historical context. Unfortunately, the reader must wade through some old canards, including the one about Catherine de’ Medici’s’ cooks – a tale that has been shredded of every last vestige’ of believability by a number of scholarly culinary historians – and a few red herrings, such as Scully’s chasing down the origins of words by means of convoluted logic and speculation, without ever arriving at satisfactory conclusions. Yet the book has some positive attributes. The three works included here are excellent examples of seventeenth-century cookbooks, and we are lucky to have them translated into English and published for modern readers by Prospect Books. This British publishing house, founded by the late Alan Davidson, has done historians an enormous service in its numerous reprints and facsimiles of antiquarian cookbooks that most of us could never dream of owning in the original. Like reading itself, all translation is interpretation. If anyone is aware of this, it is Scully. Working with old texts presents many questions about how much to modernize recipes for today’s readers and how far one can go while still remaining faithful to the original text. Either way, the result will be at times a bit awkward. Scully’s translation is accompanied by extensive footnotes to help the modern reader navigate the shoals of seventeenth-century French. The very detailed glossing of the original works, using a number of sources required extensive work on Scully’s pact and demonstrates with admirable transparency just how complex the translator’s job is. It is an unusual decision to include remarks on the contemporary English translations of both Cuisinier (The French Cook, London, 1653) and Pastissier (The Perfect Cook, London, 1656) in the introduction and in the glosses. Finally, instead of a single standard index, Scully supplies six appendices that categorize and index various elements from the three texts, including Ingredients, Preparations, Kitchen Equipment, and Weights and Measures. Has Scully translated these recipes so that we can cook them today? It is more his goal to bring today’s historian or cook into a seventeenth-century kitchen than to put seventeenth-century food on our tables. But there is nothing for learning about historical recipes like getting into the kitchen and grappling with a few.